If you are a student looking for short-term accommodation in Durham, look no further. Make the most of flexible tenancies in the area with Prestige Student Living, regardless of the length of your stay. Whether you are taking part in an exchange semester, preparing for a short course in Durham or doing something else in the city, all students are welcome at Duresme Court, where you can access the same facilities and benefits as the full academic year residents. Enjoy large rooms, modern social spaces, superfast Wi-Fi and on-site laundry. Utility bills are included in the rent payment, which makes it easier to budget. Duresme Court is only a three-minute drive away from Durham University, and is also close to the university’s business school, University College and Durham Law School. Measuring 30m² and offering spectacular countryside views from the higher floors, this Premium Twin is the largest studio in the building. Complete with ¾ bed, ample storage, dining area, mirror, study desk and chair and modern kitchenette, there is a fully-fitted en-suite with large shower. Access to cinema and games room, and large study space. Spacious self-contained room measuring 17m², located on higher floors with stunning views of the countryside. 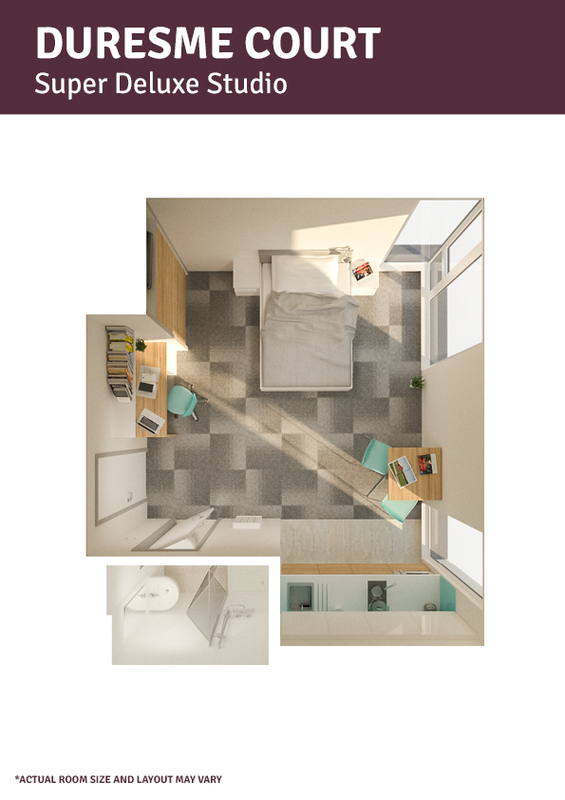 Comes with a ¾ bed, dining area, ample storage, mirror, study desk and chair, and modern kitchenette. Fully-fitted en-suite with large shower. Access to cinema and games room, and large study space. This Classic Studio measures 19m², featuring a ¾ bed, dining area, ample storage, mirror, study desk and chair, and modern kitchenette. Fully-fitted en-suite with large shower. Access to cinema and games room, and large study space. Located on the higher floors for amazing countryside views, the Classic Studio Plus measures 19m². It features a ¾ bed, dining area, ample storage, mirror, study desk and chair, and modern kitchenette. Fully-fitted en-suite with large shower. Access to cinema and games room, and large study space. A more spacious studio measuring 19-20m². Home to a ¾ bed, dining area, ample storage, mirror, study desk and chair, modern kitchenette, and large accessible en-suite bathroom. Fully-fitted en-suite with large shower. Access to cinema and games room, and large study area. Large studio measuring 19-20m². Features a ¾ bed, dining area, ample storage, mirror, study desk and chair, modern kitchenette, and large accessible en-suite bathroom. Fully-fitted en-suite with large shower. Access to cinema and games room, and large study area. Situated on the higher floors, with stunning views of the countryside, this large studio measures 19-20m². Features a ¾ bed, dining area, ample storage, mirror, study desk and chair, modern kitchenette, and large accessible en-suite bathroom. Fully-fitted en-suite with large shower. Access to cinema and games room, and large study area. A large, luxury 21m² studio with ¾ bed, dining area, ample storage, mirror, study desk and chair, modern kitchenette, and large accessible en-suite bathroom. Fully-fitted en-suite with large shower. Access to cinema and games room, and large study area. A large, luxury 21m² studio located on the higher floors for spectacular countryside views. Comes with ¾ bed, dining area, ample storage, mirror, study desk and chair, modern kitchenette, and large accessible en-suite bathroom. Fully-fitted en-suite with large shower. Access to cinema and games room, and large study area. A very large, luxury 23-25m² studio with ¾ bed, dining area, ample storage, mirror, study desk and chair, modern kitchenette, and large accessible en-suite bathroom. Fully-fitted en-suite with large shower. Access to cinema and games room, and large study area. Spacious 23-25m² studio on the higher floors with stunning countryside views. Features a ¾ bed, dining area, ample storage, mirror, study desk and chair, modern kitchenette, and large accessible en-suite bathroom. Fully-fitted en-suite with large shower. Access to cinema and games room, and large study area. 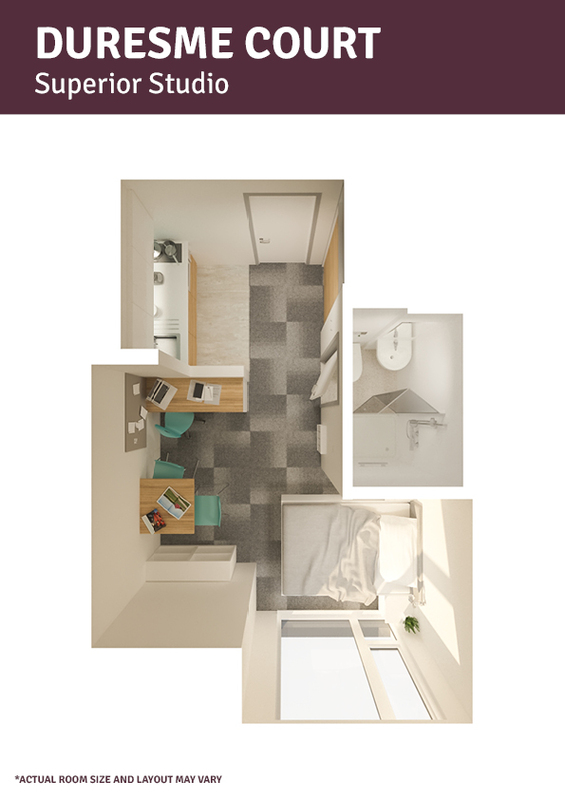 Duresme Court, a brand-new luxury student accommodation in Durham, features a range of high-end quality studios, giving residents the opportunity to experience the ultimate student experience. The property boasts elegant study and communal areas, contemporary gym facilities, a cinema lounge, and cookhouse. Residents enjoy the added bonus of being located to some of the city’s leading nightlife venues and amenities, while Durham University is only five minutes away by car. Student-friendly nightclub Klute and Osbournes Bar are located on Elvet Bridge, which is just a 15-minute bus ride, and Prince Bishops Shopping Centre and The Riverwalk can be reached within 20 minutes on foot. Durham is also renowned for its cultural attractions. Take a 10-minute car journey to Durham Cathedral and enjoy the famous tour, or check out 500-seat arts venue The Gala Theatre, where you will find two cinema screens and a café bar.